← Entertainment Expo reveals Biggest Game of the Year – Social Justice Warrior: The Age of Rage! The following post is shared with permission from Kent McManigal. He notes that this is but one of a series of messages sent back in time from an alternate time-line in which a free society has become reality. This isn’t the only way a free society could work, but one of many. For more of his work, please see: KentForLiberty.com and DullHawk.com! There is obviously no such thing as a “police force” in Libertopia. We learned our lesson from those last few chaotic years before the collapse of the State. It’s a mistake, and body count, we won’t repeat! What we do have, almost everywhere, are security services. What would have been called “private security” back during the government era. Now, since everything is “private”, the distinction is meaningless. Of course, there are many variations in security providing services– just about any variation you can imagine. The services they provide vary. The majority are simply there to help train people in defense. Everyone can benefit from expert advice and tips. A few will actually take on the job of defending their clients; mainly the very old, the crippled, and those whose personal beliefs make them prefer to pay someone for defense rather than doing the job themselves. However, new defensive tools make even those with physical difficulties perfectly capable of defending themselves, if they care to (and most do). But, of those who take a more active role, the services offered are fairly standardized. Some will help stop attacks and theft. Some will act as bodyguards. Some as night watchmen, for homes or businesses. Sometimes a customer may request something more out of the ordinary– which, as long as there is no aggression or property violations requested, the sky is the limit. The price may go up depending on the amount of effort the job entails. The ways security service employees dress vary– although, as far as I know, none seek to replicate the look of the police uniforms of old. That would be a way to go out of business in a hurry; the negative memory is still too sharp, even after all these years. If you want to be shunned, appear in public (outside of Halloween or a costume party) dressed as “law enforcement” or other type of government extremist. Most dress in a way which keeps the tools of the job close and handy. Two or three guns, restrains, video recorders, a communication device (to instantly let the customer know of an incident, and call for help of whatever kind might be necessary). Penetration-resistant clothing is common, although rarely necessary. It is so inexpensive there’s really no reason to not use it. Generally, bright colors are chosen for the clothing, to identify a person as security services. On the very rare occasions when stealth is prudent, color-changing clothing is preferred so that the identity of the security provider can be known as soon as possible- as soon as dark clothing is no longer necessary. Identity-concealing masks are never worn– the good guys don’t dress like losers. To get a job with any of the security provider companies, it is necessary to pass a thorough examination to demonstrate a non-aggressive personality, an understanding of non-aggression/Voluntaryism, and to make sure there is no tendency to try to weasel out of accountability if something goes wrong and force or property violations occur during the performance of the job. The bar for accountability is set very high for a reason– there is no room in security services for cowards/bullies, trigger-happy liars, or anyone else who is seeking an opportunity to use violence against the innocent. If your security provider violates anyone during the course of his employment, you can be held accountable for hiring an unreliable person, and the cost of restitution can be very high. No one wants to risk it. 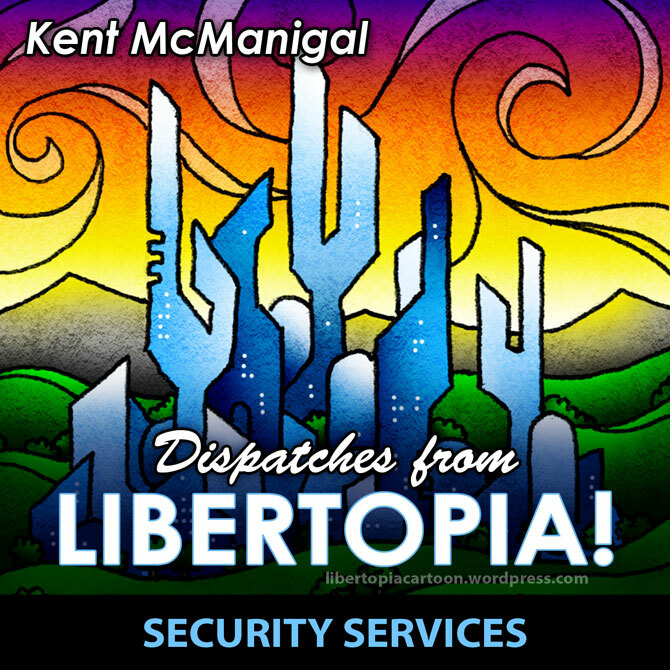 This entry was posted in Uncategorized and tagged alternate time-line, bullies, defense, free society, job opportunity, Kent McManigal, law enforcement, Libertopia, non-aggression, private security, property violations, security provider, security provider companies, security service employees, security services, sent back in time, Voluntaryism. Bookmark the permalink.